Many individual and institutional investors are growing more concerned that we may be entering an environment of rising interest rates sooner than many expected. 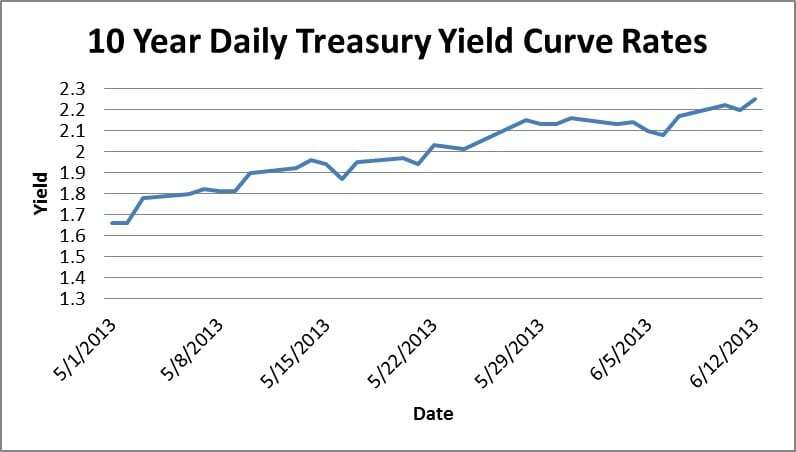 The behavior of yields on 10-year U.S. Treasury Notes since the beginning of May provides credence to this sentiment as 10-year Treasury yields have risen by 59 basis points, or nearly 36% (from 1.66% to 2.25%), during the time period of May 1, 2013 – June 12, 2013. Causes for this recent rise in yields have been primarily attributed to comments from the Federal Reserve suggesting that they may be able to start winding down their stimulus-oriented bond buying program if the U.S. economy continues to shows signs of continual improvement. Hence, some investors have been selling bonds to get ahead of Fed selling, or reductions in bond purchases, recognizing the effect that large amounts of selling will have on bond prices. I, on the other hand, believe that these yield changes are more reflective of the ongoing rotational shift from bonds to equities (primarily through mutual funds as it relates to individual investors) than it does to an increased likelihood of the Fed easing their bond buying program later this year or, perhaps more importantly, taking action on interest rates sooner than originally targeted. With respect to the latter, it should be noted that the Fed is still on record as saying that they intend to keep interest rates at historical lows through at least the middle of 2015 unless material improvements take place with respect to economic growth and unemployment (while always keeping an eye on inflation – which largely remains benign). Economic data reports are trending positive, but they are still a significant distance away from the Federal Reserve’s GDP and unemployment targets. While the Fed may start to look to gradually back away from their bond buying stimulus program without having too large of an impact on the stock and bond markets (which they would be wise to do in my opinion), I do not see anything in the recent string of economic reports to suggest that they will raise interest rates anytime soon. With this said, we, at Hennion & Walsh, do recognize that many investors are looking to brace their portfolios for an upcoming environment of rising interest rates and are taking this into consideration with respect to many of our own portfolio strategies. In this regard, while asset allocation remains critical with respect to long term portfolio performance, and portfolio strategies may vary based upon each investor’s objective (Ex. Growth or Income), investment timeframe and tolerance for risk, there are certain security types that have historically performed well in previous periods of rising interest rates and may be worthy of consideration for diversified growth portfolios. These security types include, but are not limited to, senior/floating rate loans, common stocks and convertible securities. Senior Loans – Senior loans are generally floating-rate secured debt extended to companies and typically sit at the top of the capital structure while being secured by company assets. Floating rates of senior loans typically involve a credit spread over a benchmark credit rate, such as 3-month LIBOR1. As a result, when the benchmark credit rate rises or falls, the interest rate on the senior loan will move in a similar fashion. In a rising rate environment, senior loans will see coupon payments increase while the loan value remains relatively stable. Conversely, in a declining rate environment, coupon payments on senior loans will typically decrease while the loan value remains relatively stable. Additionally, senior loans have historically maintained a relatively low correlation to other fixed income (i.e. bond) asset classes, based on certain representative benchmark indices, as illustrated in the chart below. Source: State Street Global Advisors, “Active ETF Investing in the Senior Loan Market”: Credit Suisse, Bloomberg, Ibbotson Associates, Data Stream, as of 12/31/2012. Past performance is not a guarantee of future results. 1 The LIBOR or the London Inter-Bank Offered Rate is an interest rate that banks can borrow funds from other banks in the London inter-bank market. It is fixed on a daily basis by the British Bankers’ Association. The LIBOR is derived from a filtered average of the banks’ interbank deposit rates for larger loans with various maturities in multiple currencies. The 3 Month LIBOR is the LIBOR for a three month deposit in U.S. dollars. 2 The Barclays U.S. Intermediate Government Index tracks the performance of intermediate-term U.S. government securities. The U.S. Government Index is comprised of the U.S. Treasury and U.S. Agency Indices. The U.S. Government Index includes Treasuries (public obligations of the U.S. Treasury that have remaining maturities of more than one year) and U.S. agency debentures (publicly issued debt of U.S. Government agencies, quasi-federal corporations and corporate or foreign debt guaranteed by the U.S. Government). 3 The Barclays U.S. Long Term Government Index tracks the performance of long-term U.S. government securities. The U.S. Government Index is comprised of the U.S. Treasury and U.S. Agency Indices. The U.S. Government Index includes Treasuries (public obligations of the U.S. Treasury that have remaining maturities of more than one year) and U.S. agency debentures (publicly issued debt of U.S. Government agencies, quasi-federal corporations and corporate or foreign debt guaranteed by the U.S. Government). 4 The Bank of America Merrill Lynch Mortgage Master Index tracks the performance of U.S. dollar-denominated fixed rate and hybrid residential mortgage pass-through securities issued by U.S. agencies in the U.S. domestics market having at least $5 billion per generic coupon and $250 million outstanding per generic production year. 5 The Bank of America Merrill Lynch Corporate Master Index is a market value weighted index comprised of domestic corporate (BBB/Baa rated or better) debt issues. 6 The Barclays U.S. Aggregate Index represents the securities of the U.S. dollar-denominated, investment grade bond market. The Index provides a measure of the performance of the U.S. dollar-denominated, investment grade bond market, which includes investment grade (must be Baa3/ BBB-or higher using the middle rating of Moody’s Investor Service, Inc., Standard & Poor’s, and Fitch Rating) government bonds, investment grade corporate bonds, mortgage pass through securities, commercial mortgage backed securities and asset backed securities that are publicly offered for sale in the United States. 7 The JPMorgan Emerging Markets Bond Index measures total returns of external currency-denominated debt instruments. 8 The Credit Suisse High Yield Index is designed to mirror the investible universe of the U.S. dollar-denominated high yield debt market. 9 The Credit Suisse Leveraged Loan is an index designed to mirror the investable universe of the U.S. dollar-denominated leveraged loan market. Common Stocks – Common stocks are securities that represent equity ownership in a corporation. Historically rising interest rate environments have typically been associated with periods of economic growth and positive performance for common stocks. As such, common stocks may stand to benefit from rising interest rates, and bond price declines, as investors seek investments with greater total return potential. Convertible Securities – Convertible securities are bonds issued by a corporation which are convertible into common stock at a specified ratio. Because of this, convertible securities have some characteristics of both common stocks and bonds. Similar to stocks, convertible securities offer capital appreciation potential. In addition, the hybrid nature of convertible securities makes them tend to be less sensitive to interest rate changes than bonds of comparable credit quality and maturity. Bringing together the final two security types listed above, the chart below shows the historical performance of U.S. Treasuries, Convertible Securities and U.S. Common Stocks, based on certain representative benchmark indices, during market cycles when interest rates were rising. Source: Lord Abbett, “A Convertible Counter to Rising Rate Concerns: Bloomberg, 2013. Past performance is not a guarantee of future results. Indexes are unmanaged, do not reflect the deduction of fees or expenses, and are not available for direct investment. 1 The Bank of America Merrill Lynch 10-Year U.S. Treasury Index is a one-security index comprising the most recently issued 10-year U.S. Treasury note. The index is rebalanced monthly. 2 The Bank of America Merrill Lynch All Convertibles, All Qualities Index contains issues that have a greater than $50 million aggregate value. The issues are U.S. dollar-denominated, sold into the U.S. market, and publicly traded in the United States. 3 The S&P 500 Index is widely recognized as the standard for measuring large cap U.S. stock market performance and includes a sampling of leading companies in leading industries. Disclosure: Hennion & Walsh has investments within several of its SmartTrust® Unit Investment Trusts (UITs) consistent with the product strategies cited above. This is for informational purposes only and is not a solicitation to buy or sell.